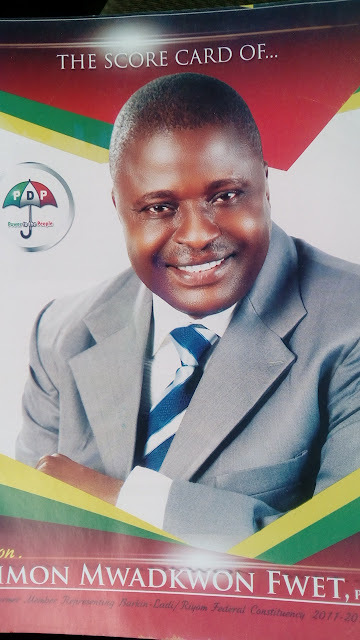 The People's Democratic Party (PDP) flag bearer for Barkin Ladi/Riyom Federal Constituency in Central Nigeria's Plateau State, Hon. Dr. Simpn Mwadkon says minority tribes in the country fail to develop for treating legislative positions as "economic empowerment" platforms. Dr. Mwadkon believes the legislature "is not a place for learning everyday." Speaking to newsmen in Jos after being declared winner of the Wednesday's Primary elections in Barkin Ladi Local Government Area, the ex National Assembly member said experience is needed to drive the process of development at the legislative level. Mwadkon, a one-time Local Government Chairman however believes the growing political awareness amongst the electorates in his constituency is behind the choice of him for another term in the legislature. He therefore assured of deploying his experience in lobbying and arguing more efficiently for the benefit of his constituents. He however requests the partnership of his defeated opponents saying his victory at the primaries is not his but the party's. He revealed that all the aspirants for the legislative seat in the constituency had agreed to work together regardless of who won. Perhaps in the light of this, an undisclosed opponent he said had called to congratulate him. "I believe others would do same but even if they don't, I will find time to visit them to see how we can work together," Mwadkon said. Mwadkon had won his Primary elections with 82 votes to beat Victor Kwon with 25 votes, Davou Mang with 51 and Daniel Dem with 62 votes.